I have known the team down at Dr. Mark Joiner Orthodontics for many years after having braces and Invisalign as an adult (A very happy customer! Don't hesitate to ask me if you have any questions about my experience!) But once the office found out I was a photographer I was able to use some of my talent to return the favor! My association with the office has brought about several weddings, portrait sessions, and their annual Christmas card portrait sessions. 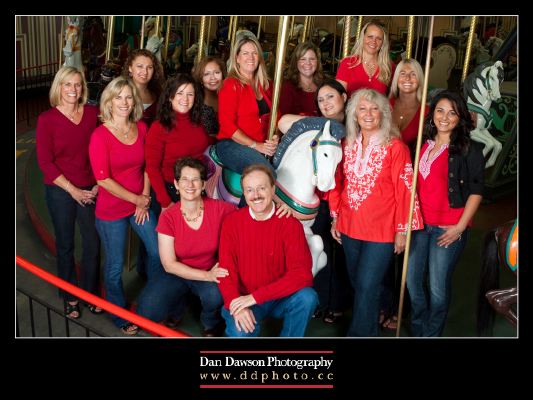 This year they were able to secure the Carousel at the Santa Cruz Beach Boardwalk for their portrait, that was definitely the first time I had the entire thing to myself! What a nice and cute story. It's like you switched favors. I love the photo too. Looking forward to reading more interesting posts from you.